How to create a successful promotional product campaign for any business According to award-winning direct marketer Mitch Carson, business owners and marketers should understand the value of using promotional items for business growth, and how to create successful promotional product campaigns. 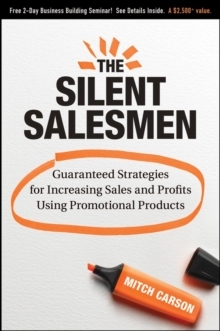 In The Silent Salesmen , Carson introduces his proven, simple promotional product strategies that are guaranteed to increase sales and profits. Business owners and marketers will discover step-by-step tips on how to develop and implement a versatile marketing plan that encompasses ready-to-use samples of sales materials paired with unique and memorable promotional products. Combined, these tools will make for an extremely effective (and profitable) marketing message.